Last week I was summoned to Leeds Metropolitan University to speak to the students. Dr Beverley West is senior lecturer in Building surveying at the University and asked me to speak to the students as part of their building pathology module. So once more it was a boot full of diagnostic equipment and armed with a memory stick I turned up. The room was full, mainly of guys and galls who could easily have called me dad (or even granddad). I can’t get 35 years into an hour so I chose to concentrate on humidity and condensation. I also spent time on the use of conductivity moister meters and moisture profiling, which went down well and seemed to hold some interest for the group. Now that it is government policy for us all to live in airtight houses, I expect mould and condensation issues to dominate ‘damp’ investigations over the coming years and I made sure that the students took on board the changes, which the construction industry is going through and how these are likely to impact on the internal environment of our homes and offices. 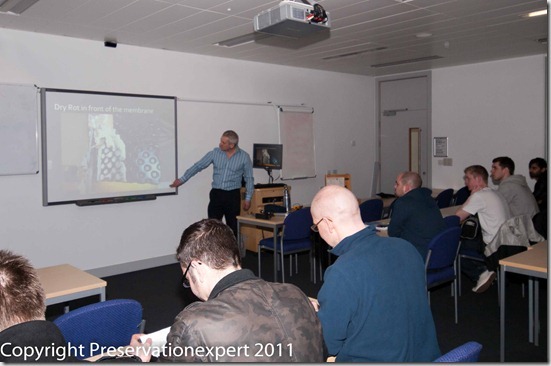 I’m keen on making sure that all surveyors start out with a good grasp of the fundamentals where damp and humidity are concerned. I’m sure that this subject is being squeezed, as surveyors find more demands on the time they can allocate to this area. I enjoyed the hour, which passed quickly and I’m grateful to Dr West and the University for inviting me along. It was good also to see so many students, especially as times are so hard – this bodes well for the construction industry. If you were there, feel free to contact me if you need clarification of anything we talked about. PS – Tonight I am in Leeds to present a CPD on structural repairs of old building to the Leeds RICS members as part of their training matrix – happy days!